The National Alliance on Mental Illness of New York City, Inc. (NAMI-NYC Metro) held their first ever #IWILLLISTEN Day on Saturday, May 9th. The event took place at the South Street Seaport Promenade, which featured the ninth-annual NAMIWalks NYC, a wellness fair and a special concert with recording artists Boola, Jenna Kyle and Romans Are Alive. First Lady of New York, Chirlane McCray, kicked off the walk with special remarks and encouragement about dealing with mental illness and what she hopes to accomplish to improve access to services in New York City. New York’s largest mental health event hosted more than 5,000 people who traveled over the Brooklyn Bridge and back to the Seaport Promenade for special live performances and a wellness fair which included activities such as free massages, basic health screenings, give-a-ways, and more. Special stations were set up where attendees could make a pledge to listen to those around them who are effected by mental illness and post #IWILLLISTEN to their social networks. HealthPlus Amerigroup served as the community partner for #IWILLLISTEN Day. 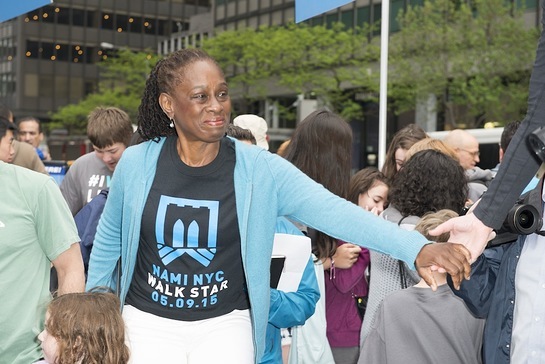 NAMIWalks NYC celebrates recovery from mental illness and helped raise funds to combat stigma and promote awareness. Funds raised from NAMIWalks NYC will allow NAMI-NYC Metro to provide no-cost support and education to thousands of New Yorkers next year including four signature, multi-week education courses, bi-monthly public education events with leading experts, and more than 20 support groups for people living with mental health and for families and friends caring for an impacted loved one.